Bolton gave their Uefa Cup qualification hopes a boost as they swept aside Charlton with three first-half strikes at the Reebok. Ricardo Vaz Te put the hosts ahead after 14 minutes when he headed home Hidetoshi Nakata's right-wing cross. Kevin Davies doubled the lead with a tap-in (21) before Jared Borgetti made it 3-0 with a crisp shot (31). Darren Bent's penalty gave Charlton hope (76) but Davies added a second (90) to seal it for Bolton. The visitors, hoping to end a dreadful away run that had left them without a win on the road since October, never looked likely of stopping that sequence from the outset. Bolton boss Sam Allardyce had freshened up his side by making four changes to the side that played out a goalless draw against West Brom on Monday. Ivan Campo, Borgetti and Vaz were all recalled to the starting line-up with Jamaican international Ricardo Gardner handed the captain's armband in place of Kevin Nolan, who was handed a bench place. But it was influential Japanese midfielder Nakata who set the tone for his side with a sweet strike after three minutes that flew narrowly wide of the left post. He then helped break the deadlock when his cross was met by a great leap by 19-year-old Portuguese striker Vaz Te who netted his first Premiership goal. Bolton went further ahead when Davies followed up Jared Borgetti's half-parried shot to fire home. And Borgetti himself looked to have put the hosts out of sight when he controversially beat the Charlton offside trap before firing inside Thomas' near post. Charlton boss Alan Curbishley made a brace of substitutions at the interval with Dennis Rommedahl and Darren Ambrose sacrificed for Jonathan Fortune and Jay Bothroyd respectively. And the Addicks were handed a lifeline when Tal Ben Haim fouled Bothroyd and Bent coolly slotted past Jussi Jaaskelainen from the spot. But Charlton were unable to build on the goal, failing to apply enough pressure as they were continually closed down in midfield. And the home side ensured that they ended a run of six games without a win when Davies headed home from close range on 90 minutes following another goalkeeping error from Myhre. "We were unfortunate not to win at West Brom because of our finishing but we've turned it on today and after going four games without a goal to get four in one game is terrific. "Hopefully we can build on this with renewed confidence in our three remaining games and try and get that Uefa Cup spot. "I'm delighted Ricardo Vaz Te got his first Premiership goal - it's about time because he's has plenty of other chances in the other games he's played for us. "But it was Kevin Davies who was again our main man and he deserved his two goals." "The first half was not good enough but we lost five players from our last game and that was crucial. "When you come to the Reebok you know the way they are going to play and we couldn't cope with them. "We could have done with a few more bigger players out there but that's no excuse as Bolton were better and stronger than us from the outset. "I changed it half-time by introducing a two players over six foot and that helped us and I wished I'd done that earlier, but we just didn't deal with what we knew would be coming our way." 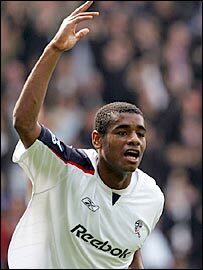 Bolton: Jaaskelainen, Hunt, Ben Haim, Faye, Gardner, Nakata, Campo, Speed (Okocha 70), Davies, Borgetti, Vaz Te (Nolan 80). Subs Not Used: Walker, N'Gotty, Giannakopoulos. Goals: Vaz Te 14, Davies 21, Borgetti 31, Davies 89. Charlton: Myhre, Sankofa (Kishishev 70), Sorondo, Perry, Powell, Rommedahl (Fortune 45), Holland, Euell, Hughes, Ambrose (Bothroyd 45), Darren Bent. Subs Not Used: Andersen, Youga. Goals: Darren Bent 76 pen.